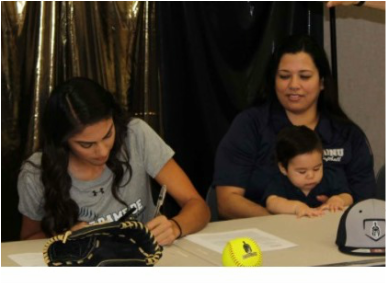 The sacrifice of early morning travel softball games and dedication to her sport paid huge dividends for left-handed flamethrower Selena Sandoval. 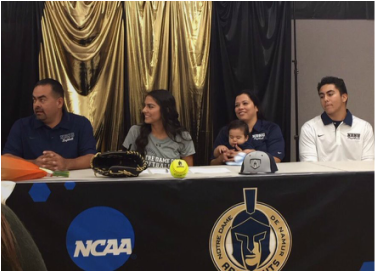 The 5’8” senior pitcher signed a national letter of intent to attend Notre Dame De Namur on an athletic scholarship Tuesday. The event, which took place during lunch, was attended by her dad Joel Sandoval, her mom Virginia Sandoval and her brothers Tomas and 7-month old Samuel. 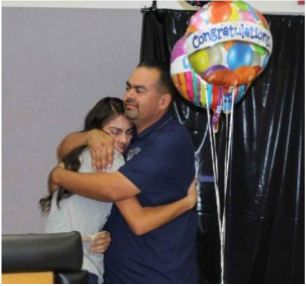 Sandoval stated that when she visited the campus, “it just felt right. It seemed like it was similar in size to Buhach which made me feel at home.” Notre Dame de Namur is a private Catholic university located in Belmont, California. The bay-area school is paying for 90% of Sandoval’s room/board/tuition.